As our usual meeting date would be on Easter Monday, our April get-together is a week earlier, on the 14th. We are delighted to welcome Katie Penlington to talk about her three-dimensional machine embroidery entitled 'Shoes, Bags and Inspiration'. It will be the last chance to book the workshop on Saturday 26th where we will be making unique scarves using soluble fabric - details below. 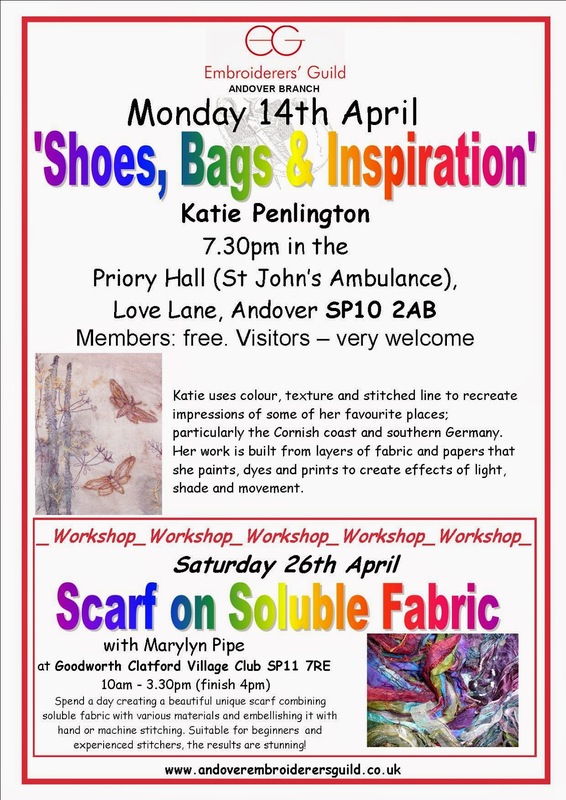 Most importantly, don't forget to bring items for our forthcoming exhibition ’Journeys Through Stitch' which is at Andover Museum from 17th May - 21st June. Please mark everything (including the packaging) with your name and include the insurance form. Another opportunity to showcase our members’ talents!